Crystal blue waters, coral reefs and white sands draw tourists from around the world to Sharm El Sheikh. Add to that a hive of nightclubs, a liberal atmosphere and a load of hotels offering cheap prices for the whole package. What you get is a highly popular tourist destination. 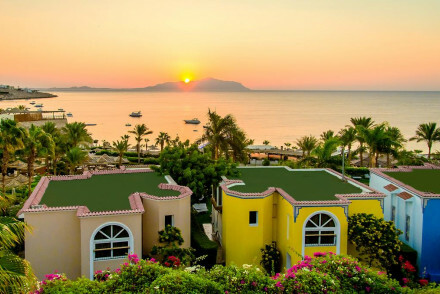 The best places to stay in Sharm El Sheikh include five star resorts and a small diving club that offers fantastic access to waterports. Na’ama Bay and Sharm al-Maya bays are home to incredible tropical fish and offesome of the best snorkelling and scuba diving. Take a day trip to walk up the world famous Mount Sinai. Renowned for religious significance, it offers staggering views from top. Tie in a trip to Mt. Sinai with a visit to Saint Catherine's Monastery. Built in the sixth century, this is one of the oldest Christian monasteries in the world. Just a few miles down the coast, the stunning Ras Muhammad National Park is definitely worth a visit..
Sharm El Sheikh is what it is and for those who see its beauty in its crystal shores then the best places to stay are Five Stars or a cheaper option that focuses on the diving opportunities. The Royal Savoy combines five-star luxury with traditional Egyptian style. Boasting fabulous private villas with private pools and ocean views as well as a selection of superb restaurants. This hotel is at the top of its game. Four Seasons Resort Sharm El Sheikh - a private white sand beach, lagoon-style swimming pool, Mediterranean, Arabic, and Italian fine dining. Oonas Dive Club Hotel on the Red Sea coastline not only has a fully equipped dive school and daily yachts to charter but has rock bottom prices for simple rooms with balconies. For people looking for somewhere all to themselves, we recommend visiting our online partner Booking.com. The surrounding area is serviced by Sharm el Sheikh Airport. For those interested in hiring a car, we recommend you visit our online partner Rentalcars. It's best to avoid June to August when the temperatures are unbearable. We recommend visiting in either Spring or Autumn for more pleasant climes. Browse through our list of best places to stay in Sharm el Sheikh. The ideal spot for a family holiday with emphasis on the water. Hotel boats to charter every day for diving and snorkelling, plus buffet lunches on board. Simple, excellent value rooms with private balconies and a good traditional restaurant. A beautiful Five Star hotel with a private white sand beach. Six stylish restaurants serve Italian, Mediterranean, and Arabic cuisine. A state of the art spa has all natural treatments. Sumptuous rooms and suites all in cream and light wood with private balconies. Perfect for couple and families. Foodies - Six stylish restaurants. The Royal Savoy enjoys a fabulous coastal location in Sharm El Sheikh. This 5* property offers luxurious accommodation furnished in a traditional Egyptian manner. Villas complete with private pools and gardens, are also available. Boasting a divine array of restaurants and bars! Simply superb.